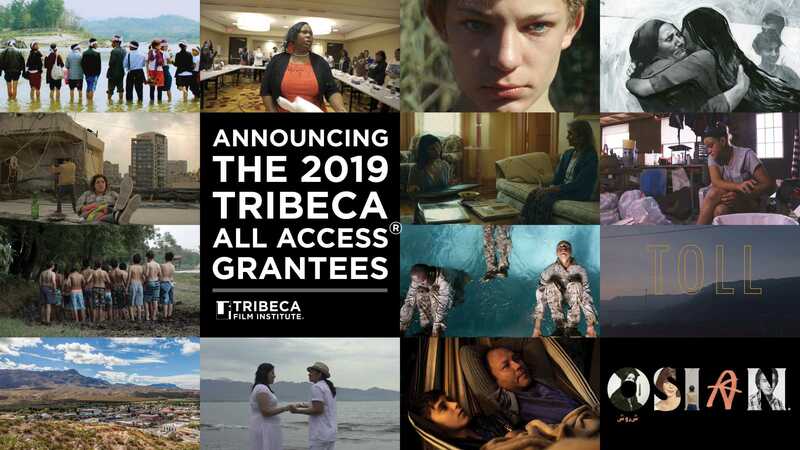 [New York, NY – March 21, 2019] – Tribeca Film Institute (TFI) announced today, the selection of fourteen exceptional scripted and documentary projects for the 16th annual Tribeca All Access (TAA) program, which amplifies stories from historically underrepresented voices. Established in 2004, TAA has since supported more than 560 filmmakers including Roger Ross Williams(GOD LOVES UGANDA, TRAVELING WHILE BLACK), RaMell Ross (HALE COUNTY THIS MORNING, THIS EVENING), Natalia Almada (AL OTRO LADO), Pacho Velez (THE REAGAN SHOW), and Tchaiko Omawale (SOLACE). Recent TAA-supported films include MONSTERS AND MEN, MIDNIGHT TRAVELER, PAHOKEE, BUILDING THE AMERICAN DREAM, SELAH AND THE SPADES, WHOSE STREETS?, ALWAYS IN SEASON and THE UNAFRAID. Premiering at the 2019 Tribeca Film Festival will be TAA-supported THE SHORT HISTORY OF THE LONG ROAD, STRAY DOLLS, and A WOMAN’S WORK: THE NFL’S CHEERLEADER PROBLEM. TAA is TFI’s flagship and longest-running filmmaker program, providing financial support in the form of grants as well as a broad range of mentorship for storytellers who create groundbreaking projects that bring marginalized voices with vital stories to tell, to a mainstream audience. The next stop for these filmmakers will be the TFI Network, a filmmaker/industry market, which provides an opportunity to meet with film industry experts including distributors, funders, programmers and mentors. TFI Network takes place during the Tribeca Film Festival. TFI is the first funder of many of this year’s projects, demonstrating the Institute’s tenacity for identifying and amplifying storytellers ahead of the curve. TAA is made possible by philanthropic support from the Oprah Winfrey Charitable Foundation, the National Endowment for the Arts, and the New York State Council on the Arts. And, new in 2019, a grant from Bloomberg Philanthropies will support a select number of TAA grantees from Latin America. After the death of his graffiti-writer brother, 15-year-old Trey follows Luke, a train hopping crust punk and his surrogate family of runaways, artists, and activists on illegal train rides that take him deep into a world off the grid. COYOTE BOYS is a portrait of rootless youth experiencing loss and loneliness — creating alternative ways of surviving 21st Century America. The first-year students of an elitist religious school are attending a “faith and integration” camp outside Mexico City. What begins as a tranquil retreat soon becomes dangerous when a mysterious hole is found in the perimeter fence. In the age of “Don’t Ask, Don’t Tell,” homeless youth Ellis French joins the Marine Corps in a last-ditch attempt to change his life, but must conceal his attraction for his drill instructor in order to survive boot camp. In 1976 civil-war-torn Beirut, a young rebellious woman fights to free her neighborhood from the control of the Holiday-Inn Sniper and to maintain her relationship with a woman bound by social norms. In Brighton Beach, Brooklyn, a Filipina immigrant scrambling to avoid deportation becomes involved with a Russian slaughterhouse worker who is unaware that she’s transgender. Set in an apartment complex outside Oakland, OSIANtells the story of neighboring Persian-American families through the eyes of two teenagers — one reeling with the death of her mother, the other obsessed with raising money for his own funeral. Told with dark humor, TOLL centers on Suellen, a toll booth attendant who realizes she can use her job to help a gang of thieves steal watches from the wealthy people driving between São Paulo and the coast. But this is only for a noble cause: to send her son to an expensive gay conversion workshop led by a renowned foreign priest. ABOVE AND BELOW THE GROUND tells the story of brave indigenous women activists and punk rock pastors who come together in the struggle for environmental self-determination in Myanmar’s war-torn North. A last line of defense for communities caught between coveted natural resources, military cronies, and profit-hungry multinationals, these activists fight back the best way they know how–through protest, prayer, and Karaoke music videos. BLACK MOTHERS follows the journey of two women working to disrupt the cycle of racist violence within our country’s injustice system. As one mother navigates the aftermath of her son’s attack by local police, the other channels her grief into organizing other mothers to fight for—and win—concrete change and justice. A filmmaker searches to uncover her family’s Iranian past. Excavating the formative memories of her grandmother, mother, and self, JOONAM explores the evolving shape of girlhood – and, with it, the complex relationships between mother and daughter, Iran and America, and the immigrant experience as it ripples over time. Trans filmmaker Madsen Minax returns to his rural Michigan hometown following the death of his infant niece and the wrongful incarceration of his brother-in-law. As he navigates a town steeped in addiction, economic depression, and religious fervor, Madsen creates a relentless portrait of an enduring pastoral family. As the war between the Revolutionary Armed Forces of Colombia (FARC) and the Colombian State comes to a long-awaited end, filmmaker Ivan Guarnizo and his brother pursue the truth behind their mom’s kidnapping at the hands of the FARC group and struggle to understand how she was able to forgive her captors in the last years of her life. THE SILENCE OF MY HANDS follows Rosa and Saira, two Mexican deaf women in love, as they struggle with the adversities of their language, the distance that separates them – and the limited time that they have together, as an unforeseen illness impacts their relationship. Faced with a dying Earth, humanity built a spaceport in the desert of Truth or Consequences, New Mexico. Those who could leave, ventured in search of new planets to call home. This is the story of the people who stayed. Tribeca Film Institute helps to ensure that storytellers from multiple backgrounds have access to the resources and tools they need to tell their stories, connect with audiences, and thrive in their careers. In collaboration with like-minded organizations and creative thinkers, we provide funding, mentorship, industry connections, growth platforms, and continuous alumni engagement to creators whose points of view have been marginalized or misrepresented due to factors such as race, ethnicity, gender, sexuality, class, geography, and/or politics. We believe that putting storytellers first and working with them to expand access, exposure, and sustainability fuels the creative ecosystem and enriches our culture. Tribeca Film Institute is a year-round nonprofit arts organization founded by Robert De Niro, Jane Rosenthal, and Craig Hatkoff in the wake of September 11, 2001.